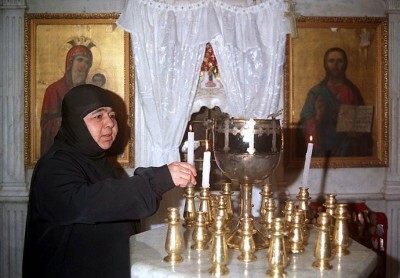 “Armed men burst in the monastery of St Thecla in Maaloula this afternoon. From there, they forcibly took 12 women religious,” Mgr Zenari said, citing a statement from Patriarchate. The group of Islamist rebels has apparently taken them to Yabrud, some 80 km north of the capital. Neither the nuncio nor the church Greek Orthodox Church know reason behind the kidnapping. Islamist Rebels from the Free Syrian Army (FSA) had invaded the small town on 5 September after driving out regime troops with the support of al-Qaeda-linked al-Nusra Brigades. After taking control of the city, they went on a rampage against Christian buildings, killing three young Catholic men. More than 3,000 people, the town’s entire Christian population, fled their homes seeking refuge in Bab Touma, the Christian quarter of Damascus. Some found shelter with relatives in Lebanon or in local Greek-Catholic convents. Only Muslims were left in town, plus 40 nuns at the St Thecla Monastery who stayed to help care for dozens of orphaned children. As of yesterday, Maaloula became again the scene of heavy fighting between the army and Syrian rebels, including many members of the extremist Jabat-al-Nusra militia. Clashes are concentrated mostly in the upper, oldest part of the town, where the St Thecla Greek-Orthodox and the Sts Sergius and Bacchus Greek-Catholic monasteries are located. From there, the rebels have launched repeated attacks against army positions in the lower part of town.